This blog is part of a 5-part series on the “Lekil Kuxlejal-Ich’el Ta Muk” (or, “Buen Vivir with Respect”) Learning Exchange, which took place last year among 120+ participants, including 18 Thousand Currents partners from 11 countries. It was hosted by our long-term partner DESMI in Chiapas, Mexico. Read more from this series here. As an Economics major with a Masters in Public Policy, experience working with Fortune 1000 companies, and as Adjunct Faculty at a Business School, I assumed I knew a lot about effective business models. One of my favorite parts of last year’s Regional Agroecology Learning Exchange in Chiapas, Mexico was the mini-fair, where my knowledge about typical business enterprises was challenged. For three days prior, 120 participants from 11 countries convened to share their experiences and expertise on agroecology, which includes conventional notions of distribution and marketing. 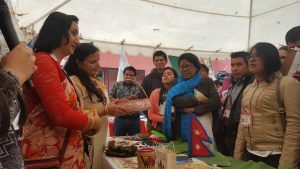 On the fourth day of the learning exchange, at an event where participants sold their wares, Thousand Currents Partners from Guatemala, Mexico, and Nepal not only shared their products, but their business practices in general, their supply chain integration strategies, and marketing plans. They blew me away! The difference between my former training and this experience thus far? The solidarity economy. exchange goods at a fair price. This is in stark contrast to the principles of traditional businesses that perpetuate inequality, limit access of capital to a few, and make a profit at the expense of the planet. As the partners made their presentations, I walked around the various stalls and the business geek in me made a few quick calculations using the Cost-Benefit Analysis framework, a tool widely used by the US government to evaluate public policy investments since the 1960’s. From my calculations, the monetary and social benefits of women-led cooperatives far exceed those of typical businesses of the same size. For instance, I met staff members from the Comité Campesino del Altiplano / Peasant Farmers Committee of the Highlands (CCDA) who support enterprising farmers to establish small businesses and scale their revenue generating capacity. Instead of selling their products to fair trade organizations, they locally produce, package, store, and ship their products. At the learning exchange marketplace, I got my hands on their organic coffee, Café Justicia. 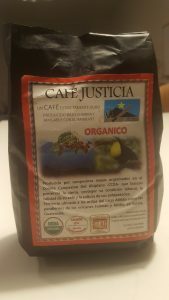 Members of CCDA have successfully marketed Café Justicia, which is now sold in the U.S., Canada, Sweden, and Belize. At the marketplace, their extensive network of cooperative businesses also showcased products like honey and macadamia nuts. They also produce high-quality fertilizers, storage units for grains, and offer responsible tourism packages that respect the values and dignity of their community. In Chiapas our inspiring partners from around the globe showed me how we can pursue wealth and achieve well-being for our communities and the planet. According to some, I may be an “expert” in business practices, but I am still a novice when it comes to the solidarity economy. And I can’t wait to keep learning!